Today's show brings me to the Missoula, Montana home of professional photographer Jessica Lowry Vizzutti. I've been following her work for years and have loved watching her build a truly impressive body of work that includes everything from huge editorial spreads to stunning wedding photography. In the episode we chat about what it's like working with (and apart from) her photographer husband, why she decided to take on a full-time position outside of her photography work, her thoughts on being a visual storyteller and much more. Did you know that a sprained ankle can cost up to $3000 to treat without health insurance? It's true. Luckily, Stride Health has your back. Head over to stridehealth.com/cyop to sign up for a free account today and avoid paying far too much for health services when you need them most. 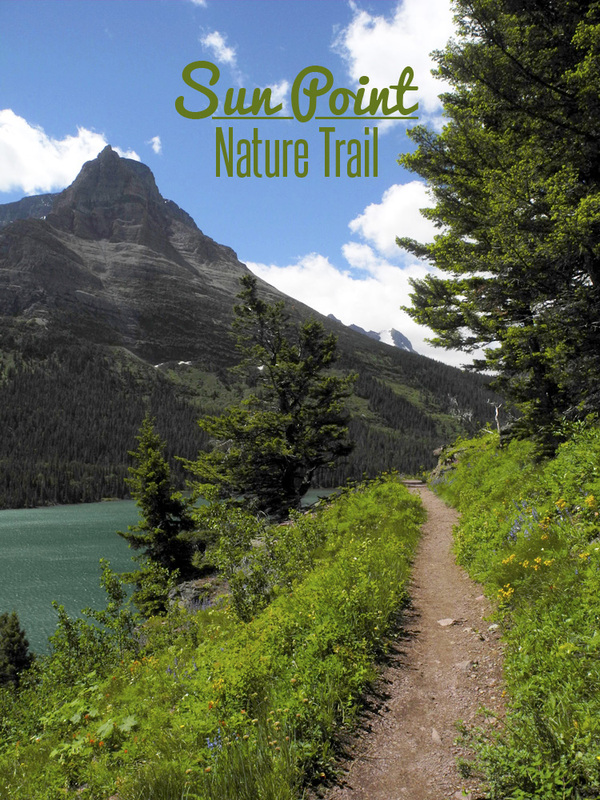 The Sun Point Nature Trail was the last hike we took on our recent trip to Glacier National Park. The day was (finally) sunny and windy as we headed down from Logan Pass toward the east side of the park. The trail begins just off the Going-to-the-Sun Road in the St. Mary Lake area. You'll see signs for Sun Point and the turn-off will take you to a parking lot. The great thing about this trail is that it converges with several others leading to waterfalls and backcountry lakes and campgrounds. We started off the day by heading up to the Sun Point viewing area. The wind was incredibly strong, however, the viewing area offered a fantastic view of western-most portion of St. Mary Lake and the mountains that make up the continental divide. Read: It's worth being shoved around a bit by the elements. Our plan was to see at least three of the waterfalls accessible via the Sun Point Nature Trail parking lot: Baring Falls, St. Mary Falls and Virginia Falls. Once you start the trail along the north edge of the lake, you'll want to stop often to take in the view. Several groups of hikers had stopped on either side of the bridge to take photos and have lunch, so we opted to keep going toward Virginia Falls. The trail quickly became much quieter, so I'm guessing a lot of people turn around and head back after seeing St. Mary Falls. Just after leaving St. Mary Falls, we spotted a deer grazing on the trail. She heard us coming and headed back down the hill before I could snap a good picture. I would imagine the trail sees plenty of wildlife thanks to its lush plant life, dense tree cover and abundant water sources. When you reach Virginia Falls, you'll hear it before you see it. There are two viewing spots for this good-sized waterfall. One can be found after crossing a short bridge along the trail that heads around the south end of St. Mary Lake. However, we decided to see the waterfall up close by heading up to the Virginia Falls View Point. The one sunny day during our trip and we found ourselves a place to get sopping wet at the bottom of Virginia Falls. Of course, I didn't take many pictures at this point. There was so much mist coming off the falls! The water rushing down the rock walls combined with the powerful wind and the slippery rocks underfoot made for a fun, but short stay at Virginia Falls. We turned to leave and I realized that I was sporting the biggest grin ever. If you only have one day and want to experience some beautiful waterfalls, I highly recommend this trail system. According to our calculations the hike was a little over 6 miles round trip -- from the Sun Point viewing area up to Virginia Falls and back. The hike wasn't difficult, but there were definitely some windy and slippery areas along the way. Also, be sure to follow your map and pay attention to signage as there are several forks in the trail to get to the various waterfalls. I do have to note that the Sun Point Nature Trail is also a great starting point for a longer hike to Gunsight Lake. From what I can tell on the map, you can even hike this trail system all the way to Lake McDonald on the west side of the park! Have any of you checked out the waterfalls around St. Mary Lake? I know Sun Point is a really popular area during the summer months. If you've been to Sun Point before, perhaps you can answer me this: is it always so darn windy?? Here's the thing about national parks: there are some very popular places and sights and then there are those places that see a little less traffic. In Glacier National Park, it seems that the Going-to-the-Sun Road and areas directly surrounding park entrances, visitor centers and lodges see the most traffic. Upon arrival at the Glacier General Store and Cabins, however, Chuck recommended the lesser known trek to Bowman Lake. You can see why, yes? Chuck gave us fair warning about the roads leading to Bowman Lake. He mentioned that we would have to exit the park, take the Outside North Fork Road (the inside road was closed) and head through the small town of Polebridge before re-entering the park at the Polebridge Ranger Station (see a map here). On our first full day in the park, we decided to give it a shot...right after our morning hike to Avalanche Lake and quick lunch. Gravel roads full of potholes on a rainy day? What could go wrong, right? Lucky for us, nothing went wrong. It was absolutely worth the bumpy ride! Our first order of business was to stop at Polebridge Mercantile for their famous huckleberry bear claws. They were huge and lived up to their reputation. When we finally arrived at the parking area for Bowman Lake, we were greeted with a nearly empty campground and beautiful surroundings. Walking down to the lake, we could easily see why Chuck considers it one of his favorites. We hiked part of the trail around the lake and couldn't stop marveling at the color of the water... such a wonderful turquoise color. The day was still overcast and rainy, but we were thrilled to spend time in such a beautiful (and almost empty!) area of the park. I wouldn't mind spending a little more time there next time we visit! Anyone out there been to Bowman Lake? There were only a few other people there when we visited, so it seems like a great place to get away from the more touristy areas of the park. We'd love to get recommendations on hikes in the area, so feel free to share your stories in the comment section! If you're looking for a place to stay near the west entrance to Glacier National Park, look no further than Glacier General Store and Cabins in Coram, Montana. Now, don't get me wrong: there are plenty of places to stay in the area. However, Chuck, Jori and Buddy Bear (who run the facility...and yes, Buddy Bear is a dog) are incredible and I can honestly say that we wouldn't have wanted to stay anywhere else. The four cabins are nearly identical, are very reasonably priced and come appointed with comfy beds, kitchenettes and full bathrooms. We brought food with us and cooked three out of the five nights we were there, which was not only fun and fairly healthy, but allowed us to save a few bucks as well. If you choose to stay here, just know that you will want to bring silverware, plates, cooking utensils, etc. as the cabin kitchenettes aren't stocked. We planned meals we could grill and made a big salad when we got there, which suited our post-hike appetites just fine. The one dry evening we were there (remember: early summer can bring plenty of weather! ), Chuck started up the bonfire out by the big teepee. You had better believe that plenty of s'mores were consumed. Chuck and Jori are both incredibly knowledgable about the park. Just tell them what type of adventures you're looking for and they'll give you the scoop. Chuck is also well-versed in bear behavior and he gave us the run-down on how to safely enjoy our time in grizzly country. The store is full of goodies, many of which are of the huckleberry variety. I dare you not to buy at least a small jar of huckleberry jam. Chuck is also a fantastic wildlife photographer, so don't forget to stop in (even if you're not staying at the cabins) to have a look around. The store and cabins are located just off Highway 2, which is the way most people get to the west entrance of the park. While we could obviously hear and see traffic from our cabin's front porch, it didn't really bother us. Once we closed the cabin door for the night, we could hardly hear traffic at all. Bottom line: if you're bothered by light traffic noises at night, just bring a set of ear plugs. Honestly, we've stayed in hotels with more noise. Wifi is available at the cabins, but there was a little issue while we were there. (Yes, we were on vacation, but sometimes our jobs don't allow us to unplug completely.) Chuck worked to fix it as soon as he could and was great about giving us status updates. Pet Buddy Bear and you'll have a friend for life. Truth be told, we had a hard time leaving. The cabins are so cozy and Chuck and Jori are some of the kindest souls around. If we're ever in the area (who am I kidding.. when we're in the area), we'll definitely be heading back to Glacier General Store and Cabins.